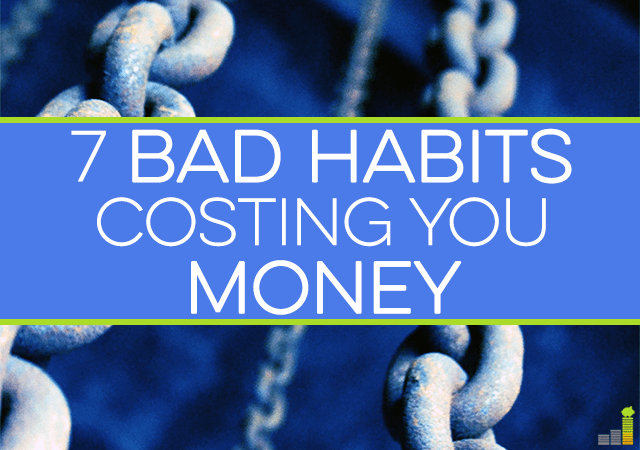 How many of you have bad habits that are costing you money every month? I’m sure we all have one or two that are costing us hundreds, if not thousands, per year. Bad habits have a way of forming in sneaky ways. Either you’re aware of them and have chosen to accept them, or you ignore them because you don’t want to face them. Living in denial isn’t the best way to move your life forward, and bad habits can spell disaster for your finances as well as your mental health. If these habits are forcing you to live on a tight budget, is the stress and anxiety really worth the “satisfaction” you get? Being aware of your bad habits is the first step you can take to form good ones. 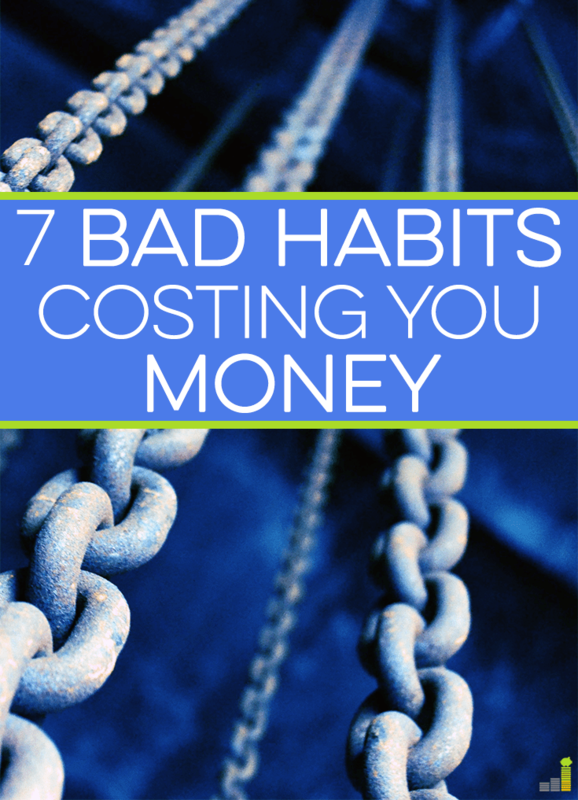 Are any of these seven bad habits costing you money? I grew up with parents who couldn’t give up smoking, and the amount of money they spent on cigarettes always astounded me. Not only is smoking (and drinking excessively) horrible for your health, but packs or cartons of cigarettes add up quickly. When we lived in NY, my parents often went to the Indian Reservation to buy cigarettes as they didn’t have to pay taxes there. Whenever they took trips down south, they stocked up on cartons before coming back as they were much cheaper. Clearly, they knew they were stretching their budget to afford this habit. Sadly, addictions aren’t rational. What about drinking? It’s less expensive, especially when you buy your own alcohol instead of going to a bar, but if you’re not careful, this habit can easily cause you to blow through your money. I had a friend who started saving money after living paycheck-to-paycheck, but after going through an emotionally trying time, found himself going out every night with friends. All the money he had in his savings account? Gone – thousands down the drain in a matter of months, and the good times weren’t worth the financial instability. This habit seems harmless until you do the math. Health concerns aside, fast food really isn’t that cheap. I try and stay away as much as possible, but my fiance has a weakness for it when he’s pressed for time. He tends to eat a lot, and he can easily order $10 worth of food for a meal at Wendy’s. How is that any better than just going out to eat at a restaurant? People like to argue if they order from the dollar menu, they’re surely saving money, but you can cook meals at home for less than that (especially when it comes to breakfast). Dollars add up, too! Eating like crap isn’t sustainable – period. It will catch up with you one way or the other, and you could end up paying the price in the form of doctor and hospital visits down the road. Another habit that might not be as bad when done in moderation (or at least mindfully) is gambling; when done carelessly, you could easily end up broke. I’ve never been to Vegas, but my grandma and her friends have made weekends of going to Atlantic City for years now. They go once a month and take set amounts of money with them. When they run out, they call it a trip. That’s their form of entertainment. That’s one thing but when you go gambling with the intent to spend everything in the hopes of winning something, that’s when it can get bad. You need to know your limits and be able to hold yourself accountable, otherwise you’re just going to end up in a worse position than you were before. This one is a no-brainer. By staying in debt, you’re incurring interest all the time. It’s always costing you to be in debt one way or another. There are ways to offset this, of course, but if you’re in consumer debt and not planning on getting out anytime soon, you’re likely paying hundreds of dollars to finance all your purchases. Who wants to be paying for something months, or years, after buying it? If you’re currently in debt, you want to find a way to attack the debt and pay if off for good. One option to do that is through consolidating or refinancing your debt. There are many ways to do this though I believe the best option is through LighStream. With LightStream, you can lower your rates to as low as 1.99 percent when you sign-up for auto-pay – their rates are fixed and no teaser rates that change after you sign up. Click here to check out your rate and apply. This is a touchy subject for many. There’s nothing wrong with giving if you’re capable of it, but putting yourself into debt to help someone out is never a good idea. If you’re constantly putting others first and putting yourself last, you won’t be able to catch up. How will you afford saving for retirement? Or medical treatments later on in life? Or basic living expenses? Don’t sacrifice your future for others. I know that’s selfish, but you’re going to end up being the one asking for help down the road. Sometimes, those who live frugally try to skip out on preventative care, whether it’s because they don’t want to pay for a visit to the doctor, the dentist, the mechanic, the vet, or for a home inspection. Unfortunately, being cheap now is going to cost you in the future. If you hear an odd noise coming from your car, get it checked out right away. It might be $100 to get it repaired, but that’s better than paying $500+ should the part go completely (and consequently damage other parts). I come from a family of rather crazy drivers, so it was no surprise I was a little speed demon when I first started driving. Thankfully, I got a wake up call coming home from my boyfriend’s house one night as a cop pulled me over and let me go with just a warning. It sounds silly, but it scared me as I didn’t want to harm my perfect record. I had seen my dad get pulled over countless times and have to pay for it in the form of a ticket and pricier insurance. No thanks! Not to mention, you could get into an accident and hurt yourself or others on the road, and then have to pay for court fees and damages. Please note with most of the above, I’m talking about going to the extremes. There’s nothing wrong with enjoying things in moderation. In fact, the responsible way to enjoy things is to plan them in to your budget; set aside money for them each month so you can enjoy things without getting yourself into trouble financially. If you’re having trouble tracking your spending, consider using Personal Capital or Mint to help you keep track of where your money is going and make adjustments when you overspend in one area or another. As in other areas of life, knowledge is power. Please know that I’m not trying to paint anyone in a bad light as I’m guilty of some of these bad habits in one way or another. None of us are perfect. I also know addictions are hard to break, but being mindful about your habits is never a bad thing. As many of us know, any number of bad habits can grow to the point where they take over our lives. If you’re unwilling to change your habits, at least include them in your spending plan. Be mindful about it. “Everything in moderation,” right? Have any of these bad habits ruined your finances? What are some of your bad habits, or habits you see others giving into, that can be disastrous? Do you disagree that any of these habits are bad? Additional resource: If you’re looking for a simple way to stay on top of all your finances so you can mitigate the impact of financial mistakes, then check out my favorite tool – Personal Capital. Completely free, it allows you to track your spending, monitor your bank and investment accounts and watch your net worth grow plus many other tools. Open a free Personal Capital account today! Erin M. is a personal finance freelance writer passionate about helping others take control over their financial situation. She shares her thoughts on money on her blog Journey to Saving. Ignoring preventative care can definitely be costly – so I’m so glad you mentioned it! Our health care budget varies quite a bit, but we don’t beat ourselves up with doctor’s visits go over budget! Health is way too important to skip out on. When I was going through a diagnosis a few years ago, the copay was $50 for every visit to a specialist. It wasn’t fun, but the alternative is much worse. I learned the hard way when I was younger of driving carelessly. Got pulled over 3 times for multiple points each time. After 3 years my driving record will finally be clean again and looking for my insurance to drop down a couple hundred bucks a year. Eating fast food and ignoring preventative care are the areas that too many people think they can ignore. Yes sometimes it takes more time to plan ahead or eat healthy, but it is better on your body. Delaying getting things checked out in our homes, cars, or especially our bodys can go from a couple hundred bucks to thousands very quickly. I think driving/tickets are what get a lot of younger people. Especially where texting/talking on the phone is illegal! Definitely agree with you on the fast food/preventative care. Long-term thinking is key! A family member and his wife have always had money problems, yet they always find money for cigarettes. It amazes me. I have to wonder if it’s ever crossed their mind to think of the tens of thousands of dollars that they might otherwise have if they’d stuck to one of the many times that they’ve proclaimed to try quitting. It’s really frustrating to watch and hear about. I tried several times to note how much money per year they were spending on smoking, but sadly, people are determined to either find the money for it, or go into debt over it. I don’t smoke, but I am a big beer connoisseur. It definitely costs me far too much especially during football season. Lately I’ve started brewing my own beer. It’s save quite a bit for our budget and it’s been a great hobby. That’s awesome! There are some habits that can be hobbies in a way, but it’s great that you’re looking into cheaper alternatives to still enjoy your beer! Staying healthy rules! I don’t smoke and drink alcohol. Imagine how much I can save from doing it. And, I am planning to drop my fast food habit. Hope I can manage it without buying burgers, fries, and pizza. That’s great! Eating at home is definitely a lot cheaper. I used to waste money going out all the time a few years ago. I typically go out twice a month now. The savings has been huge. I can imagine! It’s good to set that expectation with friends, too, this way they don’t think you completely fell off the face of the earth. #2 can be extended into eating processed foods, period. I read The Four Hour Body by Tim Ferriss and was astounded at how much the case study in the book saved money. We did the same thing (after throwing away all of the processed food in our pantry…sunk costs! Ouch!) and went shopping, and our grocery bill probably shrank by 25%. Raw meats and veggies are cheaper than meats and veggies that have had human hands helping “enhance” them. Plus, spices are cheap! Thanks for commenting, Jason! Yep, processed/junk food is bad news. Whole foods and protein are much more filling, so you also feel the need to snack less.